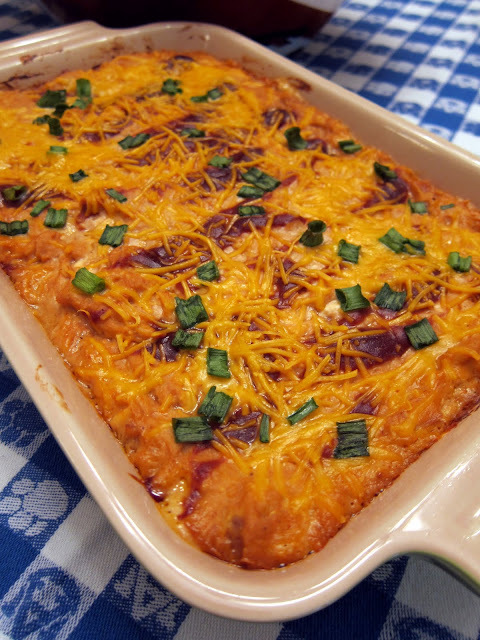 BBQ Chicken Dip - chicken, cream cheese, bbq sauce, ranch dressing, cheese and green onions - I could eat this dip as a meal!! SOOOO good! Great dip recipe for parties. Everyone always wants the recipe. 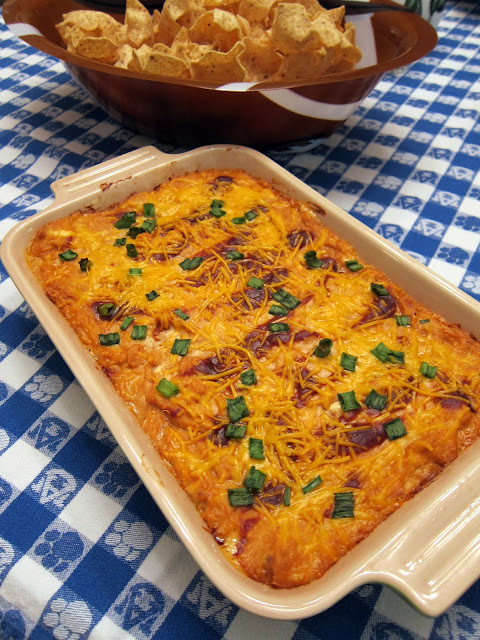 This is a variation on one of our favorite tailgating dips, Buffalo Chicken Dip. I basically substituted my favorite barbecue sauce for the buffalo sauce. This was a huge hit at our tailgate party last weekend. I should have made a double batch because it was gone in no time! I used chopped rotisserie chicken, but you can use any type of cooked chicken you like (canned, baked or boiled). The dip can be made the night before and just heated up when you are ready to serve it. 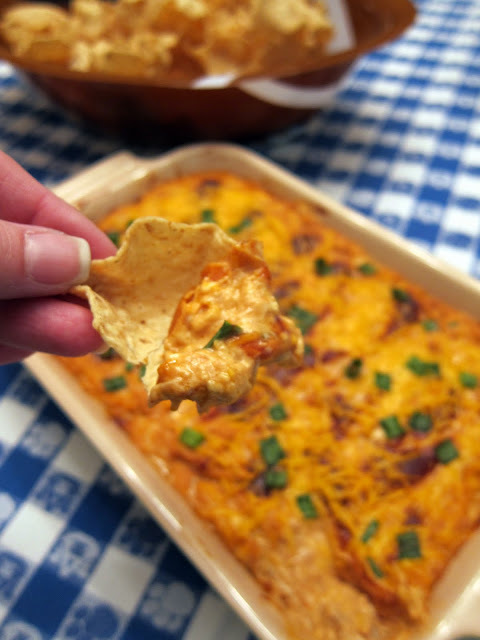 We like to serve the dip with tortilla chips, pita chips, Fritos or crackers. In a mixing bowl combine chicken, cream cheese, sour cream, ranch dressing, barbecue sauce, and 1 cup of cheddar cheese. Pour mixture into a lightly greased 8x8 baking dish. Top the dip with chopped green onion and remaining cheese. Yummy idea! Do you transport it after cooking, and if so do you have tips on keeping it hot? Also, I would love to know where you found your game day tablecloths, both this one and the orange and blue plaid. I just found your blog via Iowa Girl Eats...and yours might be my new favorite. Everything looks delicious! Teresa - I found the tablecloths at the University Bookstore on campus (Haley Center). They also sell the fabric at the fabric stores in Auburn/Opelika - at least they did a few years back. To transport the dip, I have a Pyrex carry case that has a bag of gel (I guess) that you heat up in the microwave. It slides in a pouch in the cover and keeps everything warm. I bet you could find something similar in the camping section at Wal-Mart or Academy. Another in a long line of great snacking dishes from you. Absolutely wonderful. It is now scheduled for next weekend. this is one of my roomates from college's favorite dishes for tailgating! You must be the queen of the tailgate! Chris - They actually did crown me Tailgating Queen one year! It is my favorite time of the year!! Omg! Just got done making this for a BBQ I'm going to tomorrow. I could've seriously sat here and eat it all leaving none for tomorrow! I was a little unsure how this would turn out because I absolutely LOVE the buffalo chicken dip but this is so delicious. Will definitely make again! PS - I cooked it on the stove top first, then threw it in a casserole dish and put the cheese on top. Will warm it up tomorrow to melt the cheese! What are some good brands of BBQ sauce to use? Can you cook this in a crock pot to keep warm? This dip is amazing! My teen son said it was his new favorite. We like it hot so I used STUBBS spicy bbq and it turned out great. I even made a diary free version and it was awesome too! Thanks!! So I made this using Sweet Baby Rays BBQ sauce. It was a bit too sweet tasting to me when I checked the mix before baking so I added some Texas Pete to my mix as well. That made it better. I think in the long run I might like it better with half BBQ sauce and half Hot Wing Sauce next time. Make sure the BBQ sauce isn't sweet! Then you'll have sweet cheese dip-blech. If you do make that mistake, then mustard will cut down the sweetness.